The increasing number of endpoints and the growing complexity of IT landscape brings in the need of having a unified method of managing IT. 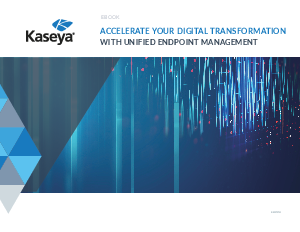 Unified Endpoint Management (UEM) gives organizations a simple, flexible way to manage and secure endpoints from an all-in-one single platform. With capabilities such as centralized discovery and management, automation and remote control, UEM equips enterprises to address complex problems encountered by IT in the current landscape. Download this ebook to learn how to enable your IT teams to eliminate roadblocks and increase productivity and move forward on their way to the digital transformation of the enterprise.